I dropped off my puppy yesterday to be spayed. They were prompt and thorough telling me everything about her procedure from the night before to the two week follow up. Very thankful for these confident pleasant people to help a nervous dog mom through her first puppy’s biggest step so far. – Brandy M.
I had my 1.5 year old female rabbit spayed with this clinic recently and was so pleased with the whole experience. 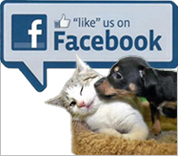 The clinic itself runs like a well oiled machine, all staff is knowledgeable and kind and loving of the animals. I was nervous to bring a rabbit in for a surgery but they did a wonderful job and left me with great instructions for aftercare. Highly recommended! – Lindsey D.
This is a wonderful clinic & shelter. Thank you for all you do. – Stephanie S.
I have to say it was the best efficient trip to the vet I’ve ever taken. I just had my 7 month old chihuahua poodle mix neutered. It’s been one week and he has made incredible recovery ..like it never even happened! – Michelle L.
My cat needed her eye removed and they saved her life on more than one account. Affordable effective and amazing appreciation for animals. I cannot thank them enough. – Cheryl L.
To everyone at the Sterling Shelter: Thank you so much for making my Truman’s (the Dorkie) dental experience a healthy and positive experience. His teeth look amazing! I wanted to say I appreciate the care and service on Monday and the also for caring enough to call me and let me know the status of his treatment. He is doing well. Regards Kate R. Amazing!! We had our 9month kitty Bella spayed here and I can stay I am utterly amazed! Not only is it affordable, but the staff is friendly and caring. I loved the way they spoke to Bella. I have been to vets where the staff has no personality and they treat your animal like every other; in and out! !… The surgery went great and so did her recovery! She never looked uncomfortable at all! And now she is more affectionate…can’t say I mind that at all! Thank you for all your exceptional care! Pay it forward and volunteer. Jenny D.
Thank you so much for the excellent care you took of our cat Spiff today during his dental cleaning. It’s hard to leave my boy, but I know he’s in such good hands with you folks — especially Jennifer, who was fabulous today. Everyone was so communicative about his procedure all day, and truly took the time to explain everything. I can’t tell you how much we appreciate this loving, and very affordable care. Ever since we adopted our two cats from you in 2012, the Sterling Shelter has had a very special place in our hearts. THANK YOU!! Monique D.
This is a wonderful clinic & shelter. Thank you for all you do. Stephanie S.
Very impressed with the clinic and their services I had 3 puppies ( one mine, one my moms and one my sisters) spayed on Monday March 3rd as was my little Mya is doing wonderful and the staff were very nice and very informative about after care, the clinic is very clean and well taken care of ! I would recommend this clinic to anyone and everyone you won’t regret it!! You all are amazing for the services you Provide and the prices are awesome!! Thank you for all you do! Jessica B.
I wanted to THANK YOU and the vet staff for the fabulous dental cleaning on Roo (Brewster). His teeth look great! I couldn’t believe how wonderful they looked and back to his crazy self the next day. Marion H.
I have to say it was the best efficient trip to the vet I’ve ever taken. I just had my 7 month old chihuahua poodle mix neutered. It’s been one week and he has made incredible recovery ..like it never even happened! Michelle L.
I just wanted to say thank you for doing such a great job with our dog Max. He had his neutering on July 3rd. He went to the vet yesterday for check up and he looks great! It is wonderful that you offer low cost services. I love my vet, but the same surgery would have been over $500.00 and with three kids and a mortgage it really helped! Danielle R.